Michael Tracy Hofius, Chalice House Artists. Art Woodturning. Replication Woodturning. Unitarian Universalist Art. Church membership books. Half turnings as applied art. Custom woodturning. 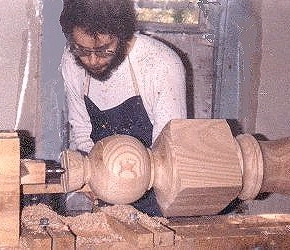 Since 1974 Michael has practiced the Art of Woodturning. Usually working on his homemade lathe, he has spun the gamut of the plain-turner's repertoire. From replicating furniture parts, balusters, porch columns, and other architectural elements, to creating one-of-a-kind art pieces such as his Communion Chalices, Flaming Chalices, and Cremation Urns. Please follow the links below and discover the services and works of Art offered by this creative artisan. the best search engine for online buyers. listed, newsgroups, message board... Add your Free listings!